Yesterday was a coming of age for our boy child. So yesterday we got our ride on. The Green Lantern, Superman, Justice League, Scooby Doo, Wild West Falls and Arkham Asylum. Many of them twice! I have to be honest, I was always a big ride junkie and never had any fear, but these days I feel a little more fragile. I don't feel as "immortal" as I used to and half way through my second ride on the Green Lantern I decided I'd had enough. It was time to get off. There is a point where your body simply says "this isn't fun anymore". That was at the end of the day though so I guess we did pretty well. Superman Ride - 0-100km an hour in 2 seconds. Green Lantern - the riders are about to be "inverted"
The Green Lantern was scary fun and like no ride I have ever experienced. Superman was a rocket launch at over 4 Gs that took my breath away and had my heart in my mouth. My eyes were closed the entire time so I completely missed it. Arkham Asylum (originally Lethal Weapon) did what it always does - it jostled my neck and shoulders so much that I ended up with a headache. The Scooby Doo Spooky Coaster completely took me by surprise. I have to admit, it was the number one ride in my books. I don't know what I was thinking but as usual I went into it "blind" without having read about it or looked at any pictures. There were a bunch of little kids lined up with their parents, and given the height requirements were much smaller than the other rides, I figured it was a cruisey little ride through a haunted mansion. Haunted yes. Cruisey not-so-much. Turns out it is a roller coaster in the dark! Worse ... it's actually like the Wild Mouse in the dark where you think you are going to fly off the coaster at each sharp corner. The surprise factor totally took it to number one status in my books. All it all it was a fabulous day. Right now though we are back in the car. Yes, I am blogging on the road. Today we head to Gladstone district where we get to see Chelsea and her bump. Keep your fingers crossed that the bump becomes an air-breathing baby over the next seven days before we have to make the long journey home again. Who else has been to Movie World? Check out the massive accommodation deal we got while on the Gold Coast. Luxury accommodation at camp ground prices. Have you visited Deep Fried Facebook yet? Come on over for a chat. I love Movieworld, the superman ride is the bomb, so scary!! The accomodation looks great too! I can't wait till my littles are big enough for movie world rides. I hope I'm still brave enough when they are . 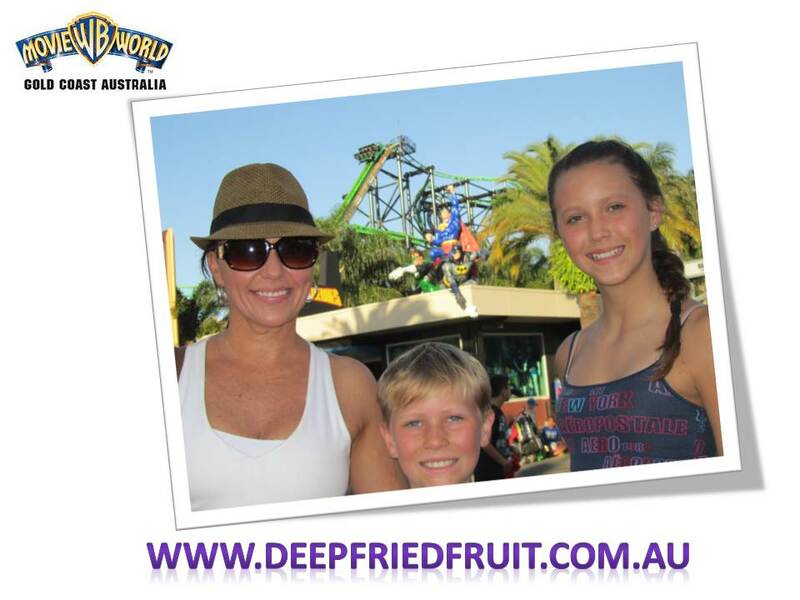 my sons adore MovieWorld but one is only just tall enough for the kids rides and the other not tall enough at all! My husband and I joke about when they will be older and we will be sitting having coffee, while the boys bounce from one ride to the next without us! You are braver than me! The Scooby Doo ride and the Wild West ride is about my limit! Oh yay for him! 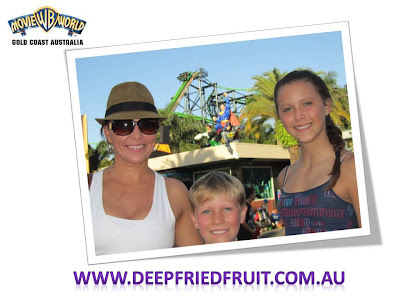 We would love to take the family to movie world one day, but are waiting till they are older and biger, for this very reason!